1. Modern American society is a ticking time-bomb where an impending social explosion is hinted at by everyday violence of all kinds— the abuse of children; physical and sexual attacks by men against women, against other men and against those who do not conform to conventional images of men and women; the mistreatment of animals; suicides; street shootings and occasional but frequent mass shootings in places like schools and entertainment events. The violence is accompanied by a widespread sense of dread that something awful may very well happen to all of us. 2. This state of affairs demands an explanation—not one about tormented minds or evil souls but one that makes sense of the fact that many individuals are coming to grips or, perhaps more precisely, failing to come to grips with the real circumstances of their lives. Modern society in the United States more or less provides individuals, families and communities with “enough” food to live and clothing to wear. It does not do nearly as well with providing them with places to live. 3. With good reason, some see themselves as much worse off than others; others see themselves as one paycheck away from being as badly off as the worst; and, not so surprisingly, others see all too many reasons to be miserable about their lives—hateful jobs, low pay, tyrannical bosses, bills that can’t be paid, illnesses and inadequate health care, drugs for every occasion (including the occasion of overdosing and killing yourselves), kids who hate their schools and whose schools appear to hate them, water they can’t drink or swim in, and, to add insult to injury, advertisements on a thousand television channels about how good sugar, diets and prescription drugs of every kind really are; you get to decide how you consume the poison—cable, fios or direct TV. We concede that there are a good number of people who think they are doing just fine—their SUV’s are getting sportier; their first and second houses are getting fancier; their pension funds are growing (until the market exacts its periodic revenges); their kids are getting into better colleges (except, of course, when those kids get murdered in a high-school shooting and they get into no college at all). They all too often believe that the good times are going to keep on coming and they are inclined to pay little or no attention to the disasters that build up like hurricanes far off in the Atlantic Ocean. For the moment, our publication is not really for them. And then there are the others, perhaps the great majority, who are concerned about where things are headed. But beyond what they do within their families and local neighborhoods, they don’t really think there is much they can do about the larger state of affairs. So they focus on what they can—taking care of parents, children, neighbors; going to church or not; coaching kids on sports teams. Somewhat remarkably, when it comes to politics, individuals who may have all but identical everyday life experiences and who behave in much the same manner at work and at home come to diametrically opposed views about different politicians—Trump is a good example of this. Life on the ground is never quite completely determined by the grand structures. In spite of it all, individuals and groups find their ways from one day to the next—they surprise with their ingenuity and generosity; they fail to do what they’re assumed to want to do; they keep alive old memories and invent new cultural practices; they say one thing and do something else—and the doing is often more important than the saying. 4. It has been observed that every institution in modern society does the opposite of what it pretends: schools spread ignorance; hospitals spread disease; the justice system promotes anti-social behavior., and so forth Nonetheless, people have ambivalent attitudes towards those institutions. Their attitudes reflect an odd combination of confidence and cynicism. They want FEMA to work in the aftermath of a disaster, but they are seldom surprised when it doesn’t. As one friend of our project told us about a neighborhood man’s reaction to the news that a local hospital would be closing (but that activists were trying to keep open), “It’s about time they shut that place down. I wouldn’t go there if my head was about to fall off.” It may well be that the most revealing institution in current American society is the lottery in all its incarnations (Powerball, and so forth)–everybody plays and almost no one wins. 5. The goal of Hard Crackers is to help bring into existence in place of the existing society (disfigured by the hidden theft of human life-time and freedom by the organization of production for the sake of production, the careless disregard of human needs, an absent-minded and frantic consumption of stuff that we mostly don’t need, lives of quiet misery in the face of the absence of human community, pervasive violence, an almost willful ignorance of the consequences of what we do to the world within which we live, and an obliviousness to the devastating consequences of American world dominance) an association in which the free development of each is the condition for the free development of all. 6. 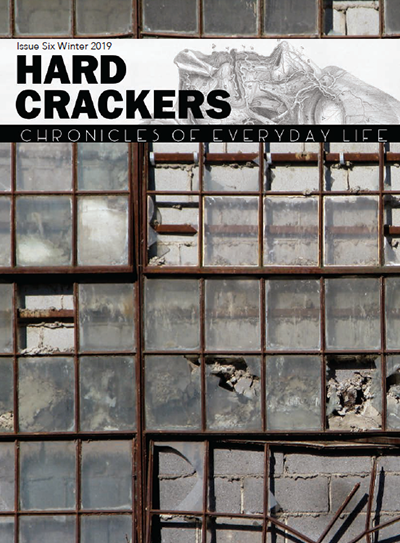 Hard Crackers chronicles everyday life, both to demonstrate that a better world is possible and to examine the barriers to it, including the barriers that have been erected by those who must build it. It seeks to be a place where black people can express their bitterness at the prolonged oppressions they have suffered at the hand of whites; where whites who resent being blamed for a history they do not think is their fault can be heard; where women can share stories of the ways in which men have mistreated them and how they have resisted that mistreatment; where men can express their own frustrations about their experiences in what used to be called “the battle of the sexes” and where young people can express their dismay at the world they are to inherit. 7. Hard Crackers is not alone in its conviction that we need to be alert to the possibilities of “the beach under the pavement” or “the future in the present.” Dramatic events that appear to have come from nowhere often have much in common with earlier developments that have eaten away at the consensus of accommodation with misery that appears so often to be the norm. Of course, it’s hard to know what will come of what goes on and some moments that appear to be full of future promise will turn out to have short lives. Nonetheless, it seems wise to carefully observe what people actually do in situations like natural/social disasters (of which we have way too many) or instances of official crimes that go without consequence (like murders by police officers) and to appreciate that the potentials may not be exhausted in the short run. Large organized actions are more easily recognized but small, maybe almost invisible acts of individuals or communities also deserve attention. The significance of all those moments deserves to be explored and debated. For Hard Crackers, the explorations and debates will primarily be done through the stories our contributors have to tell. To the everlasting shame of this country, the grand experiments in freedom were violently crushed and a cloud of reaction, initiated by terror, settled across the South—with convict labor for emancipated slaves, grinding sharecropping, Jim Crow laws restricting black lives at every turn, and the all but unimaginable crime of lynching. The reaction lasted for more than seventy years until its stranglehold was broken by the emergence of the Civil Rights movement. But the world that the segregationists made still casts a shadow over much of the country’s political life. Once again, Trump is a good example. It is not enough merely to celebrate the history of abolition, Civil War and Reconstruction or to lament the savagery of the reaction. The great figures of that day—Lincoln and Douglass, Grant and Sherman, Brown and Tubman, Garrison and Phillips—made choices, and their doing some things foreclosed the possibilities of doing others. We believe one of the foremost intellectual tasks of Hard Crackers is to examine those choices and evaluate which we think were right and which were wrong, not with the certainty that we can ever know beyond doubt but with the conviction that whatever we learn will help us make our way through the contemporary tangle to which the Civil War experience is relevant. 9. Hard Crackers is internationalist; our country is the world, our countrymen and countrywomen all humankind. We recognize no national borders and welcome all who wish to come to this land. 10. Hard Crackers is political but not defined by party or program, literary but not pretentious, scholarly but not academic. 11. At present the Hard Crackers project consists of three parts: 1) the print journal, contents of which are determined by an editorial board that functions by consensus; 2) the website, which posts blogs on a variety of topics that fall broadly within the HC purpose; 3) gatherings at which writers and friends come together to do whatever they wish. 12. Hard Crackers is paid for entirely by its writers and readers. There is no fixed cover price; people pay what they can afford. Barring paragraphs 6 and 7. I feel the present definition of “Hard Crackers” is too long, too broad and says way too much about what it is not than what it is. As a frequent reader of Hard Crackers, I can sincerely say I have enjoyed the many short stories obviously written by some of the most talented writers. Each pulling me into the lives of every day people, the true underpinnings of any community, any part of America or the world. But more significantly, is the interpretations, the perspectives the writers bring to the stories. In some I find laugher; in others meaning, and better, I may even identify, regardless of writer, character, place or subject matter. Take for instance Curtis Price analogy of the deep South States to blood sucking vampires in which a judge offered indigent defendants the opportunity to pay by making blood bank donations…. Or Jarrod Shanahan’s ride into the City on the Fung Wah Bus between Boston and NY. In it humor distracts the reader from the unpleasant conditions of a cheap ride, a pathetic writer trying on love, and an elusive rider bent on testing the ADA to the hilt! Noel Ignatiev in his article “Nothing Happened” bemoans the lack of historical perspective….and the need to think through the stories of everyday life and discover the essence of what is going on. In response, I wrote in the margin “Look children, what’s that sound, everybody knows what’s going down.” I couldn’t agree more. Such is Hard Crackers way of making sense of what may appear unusual or shocking but which is indeed easily explained on closer observation. This could not be more evident than in Amiri Barksdale’s “A Sunday in Chinatown.” Here two men, dressed in red security garb, tried to affect a citizen arrest of a mentally ill homeless man. They maced him in the face, choke hold and threatened his life for stealing a soda!!! The writer and the woman filming the incident, the only ones pleading for mercy for the poor man, would now become the target of the crowd’s lust for violence. The writer surmised “we led them by their decency up to a line, and then they bumped up against that line…got scared and turned against those bringing them there, using any billshit excuse to keep from having to go cross it…I think it was easier for them to do bc the victim was white and they didn’t have to think about whether their reactions were racist….” Who had not had a similiar experience? Sounds like the rats that throw coworkers under the bus to suspend their own inevitability. These are only a few of the “Chronicles of Everyday Life” that define Hard Crackers and inform a readership like me when pundits, TV and politics of Washington DC put me to sleep. Like the Chronicles or Stories of Everyday Life, unadulterated, so should be the definition of Hard Crackers. So glad I found this site. Of interest to me, and maybe to other readers, is a NYT piece on the shrinking middle class.